Flat Digital HDTV Antenna with VHF and UHF Frequency Range allows you to receive digital and analog broadcast TV over the air, Ultra thin and lightweight design, Universal suction-cup stand, No extra power required, Frequency Range: VHF 170-230MHz, UHF 470-860MHz, Gain: 5dBi(max), VSWR: 3.0:1(Avg. ), Impedance: 75 Ohms, Polarization: Linear, Cable: 3C-2V (1.5M), Connector: F/IEC, Dimensions: 8.30" x 4.68". Enjoy local Free HGTV 1080P supported over the airwaves. With this beautiful piano black Digital Antenna with stand. Simply connect the coaxial cable to your TV. Run a quick channel scan and you are ready to enjoy HDTV. Frequency range (MHz): VHF 47 - 230. UHF 470-790. Output impedance: 75. Polarization: linear. Standing wave ratio: <1.5. Cable length: 6 Ft.. Gain: 15dBi (max). VSWR: 3.0:1(Avg.). Input: standard coaxial. Dimensions: 22.88" x 1.00" x 2.75". Digital Flat Antenna allows you to enjoy Free TV Broadcasting over the air! Supports 1080p HDTV via simple connection via built in coaxial cable with removable suction cups that attach on glass or wood or on any solid surface. 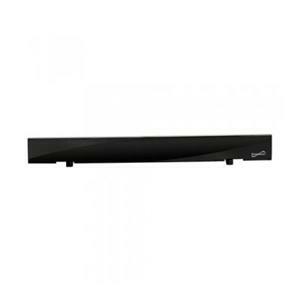 Receive Free local HDTV and UHF Signals; Ultra Thin 0.03 lightweight design; No extra power required; Frequency range: UHF 470-810 MHz, VHF 170-230MHz; Gain 5dbi (Max); Polarization: Linear; Connector:F/IEC. 360 degree HDTV Digital Amplified Motorized Rotating TV Antenna supports HDTV 1080p, 1080i, 720p Broadcast; Full Band DTV/VHF/UHF Receiver; Operates up to 2 TV Sets; Maximum Reception Range: 120 Miles; Frequency Range: 47-860 MHz Channels; Antenna Gain: 20-28dB; Impedance: 75 ohm; Power: AC 110/220V; Easy Bracket Installation; Includes 28.8ft. Coaxial Cable; Increases Signal Reception; Improves Your Picture & Sound Quality; Includes Wireless Remote; Remote Control Distance about 18 feet. 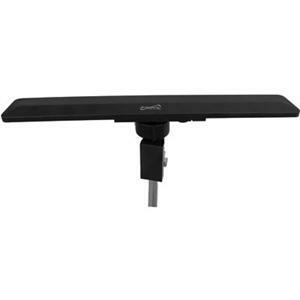 Ultra-flat HD Amplified All-Weather Outdoor Antenna. HD/DTV/VHF/UHF. HDTV 1080P, 1080i, 720P Support. Full Band DTV/VHF/UHF Receiver. Excellent reception for local HD and digital terrestrial signals. Built-in amplifier for best UHF and VHF signals reception, critical for digital television. 360 orientation for both horizontal and vertical reception. Scientifically designed flat panel array improves reception of HD and digital signals. Signal clear technology with extremely low noise circuitry. To be powered by included AC/DC adaptor or digital receiver via aerial cable. Can be wall mounted, mast mounted or railing mounted, suitable for small apartments, attic and balcony. It can withstand different weather conditions, is UV resistant, anti-rust, waterproof and UV protected. Frequency range: VHF: 174 -230MHz / UHF: 470 - 862MHz. Extends range for outdoor antennas. Enhances performance in low signal strength areas. Preserves signal purity with Extremely Low Noise (ELN) circuitry. Optimizes performance with separate UHF/VHF amplification. Switchable FM trap reduces interference from FM frequencies. Separate or combined inputs for UHF/VHF. The Ematic AT103B Digital Converter box allows your TV without a digital tuner to receive new digital broadcasts. Features an electronic program guide, parental controls, and a USB connection for multimedia playback. Full function remote control included. Converts digital broadcasts to your analog TV. Cable loop through. Electronic program guide and program information. Favorite channel list. Parental control function. Auto tuning. Auto, 16:9 pillar box, 16:9 pan & scan, 4:3 letter box, 4:3 pan & scan, 4:3 full, 16:9 wide screen. Closed captioning. EAS (Emergency Alert System). Full function remote control. Real-time recording & appointed recording. 1080P output; CVBS output. Timing startup & shutdown. USB multimedia player compatible with MP3, AAC, AVI, MPG, DAT, VOB, MKV, MJPEG, JPEG, BMP, PNG. The Universal Antenna Mount is a one of a kind mounting solution enabling consumers and professionals to easily install many different types of outdoor antennas in a variety of different mounting applications. The Universal Antenna Mount will accommodate most brand and styles of outdoor TV antennas. The Mast section of the mount is adjustable and telescopes from 24 inches to 44 inches allowing for clearance on most pitched roofs or to extend above a wall. The mounting plate was designed to revolutionize the traditional J-mount with two adjustments allowing it to be installed on angled and/or pitched surface's while maintaining a vertical positioned mast. The Channel Master CM 2016 is a compact outdoor TV antenna which will allow you to receive UHF, VHF, FM and HD signals. This antenna has a signal range of up to 45 miles and will pick up available local channels from 174 to 216 MHz and 470 to 700 MHz. With an HD television you will pick up any crystal clear HD signals being broadcast in your area. The Channel Master CM 2016 is a compact outdoor TV antenna which will allow you to receive UHF, VHF, FM and HD signals. This antenna has a signal range of up to 45 miles and will pick up available local channels from 174 to 216 MHz and 470 to 700 MHz. With an HD television you will pick up any crystal clear HD signals being broadcast in your area. Brown Box. The Channel Master METROtenna CM 4220HD is a 2-Bay outdoor TV antenna which will receive UHF, VHF, FM and HD signals. This antenna has a signal range of up to 45 miles and will pick up available local UHF channels from 470 to 700 MHz. This antenna is optimal for receiving the highest quality UHF/VHF/FM and HD signals available. With an HD television you will pick up any crystal clear HD signals being broadcast in your area. 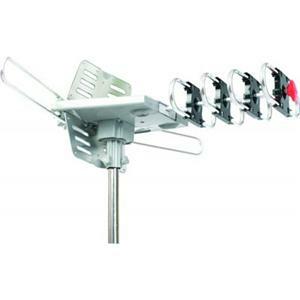 Digital Compact Outdoor Yagi Antenna, Includes Mast and Hardware. Medium-gain TV Antenna Mast Mounted Amplifier with power supply... The Channel Master television antenna booster (preamplifier) will amplify digital and HD signals received by your antenna. This antenna amplifier is a high gain, low noise preamplifier used for medium to weak signal areas to allow a weak signal that is present at the antenna to be amplified to a viewable strength. The CM7778 preamp offers less gain than the CM7777 but still has plenty of gain to get the signal from the antenna to the TV set. This preamp is a perfect choice if you are in a medium strength signal area but are still having trouble receiving good signals. Preamplifiers are also used if you anticipate distributing your signal with a digital splitter to multiple outlets throughout your house as splitters reduce the signal strength available at each output. The Channel Master CM 2018 is a compact outdoor TV antenna which will allow you to receive UHF, VHF, FM and HD signals. For VHF this antenna has a signal range of up to 60 miles and will pick up available local channels from 174 to 216 MHz. For UHF, it has a signal range of up to 45 miles and will pick up available local channels from 470 to 700 MHz. With an HD television you will pick up any crystal clear HD signals being broadcast in your area. 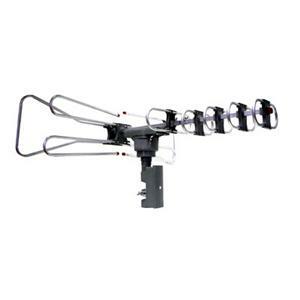 The Channel Master ULTRAtenna CM 4221HD is a 4-Bay outdoor TV antenna which will receive UHF, VHF, FM and HD signals. This antenna has a signal range of up to 65 miles and will pick up available local channels from 470 to 700 MHz. This antenna is optimal for receiving the highest quality UHF and HD signals available. With an HD television you will pick up any crystal clear HD signals being broadcast in your area. High-gain TV Antenna Mast Mounted Amplifier with power supply ...The Channel Master television antenna booster (preamplifier) will amplify digital and HD signals received by your antenna. This antenna amplifier is a high gain, low noise preamplifier used for weak signal areas to allow a weak signal that is present at the antenna to be amplified to a viewable strength. The Channel Master ULTRAtenna CM 4221HD is a 4-Bay outdoor TV antenna which will receive UHF, VHF, FM and HD signals. This antenna has a signal range of up to 65 miles and will pick up available local channels from 470 to 700 MHz. This antenna is optimal for receiving the highest quality UHF and HD signals available. With an HD television you will pick up any crystal clear HD signals being broadcast in your area. Brown Box. Flat Panel Digital, Omni-Directional Amplified Antenna. The Channel Master CM 2020 is a compact outdoor TV antenna which will allow you to receive UHF, VHF, FM and HD signals. This antenna has a signal range of up to 100 miles and will pick up available local channels from 174 to 216 MHz and 470 to 700 MHz. With an HD television you will pick up any crystal clear HD signals being broadcast in your area. 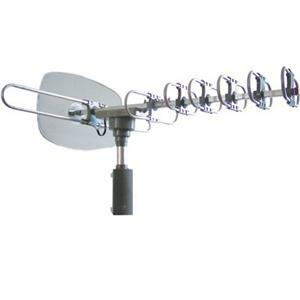 The Channel Master EXTREMEtenna CM 4228HD is an 8-Bay HD and UHF/VHF/FM outdoor TV antenna. This antenna has a TV channel signal range of up to +75 miles. This antenna is optimal for receiving the highest quality UHF/VHF/FM and HD signals available. With an HD television you will pick up any crystal clear HD signals being broadcast in your area.